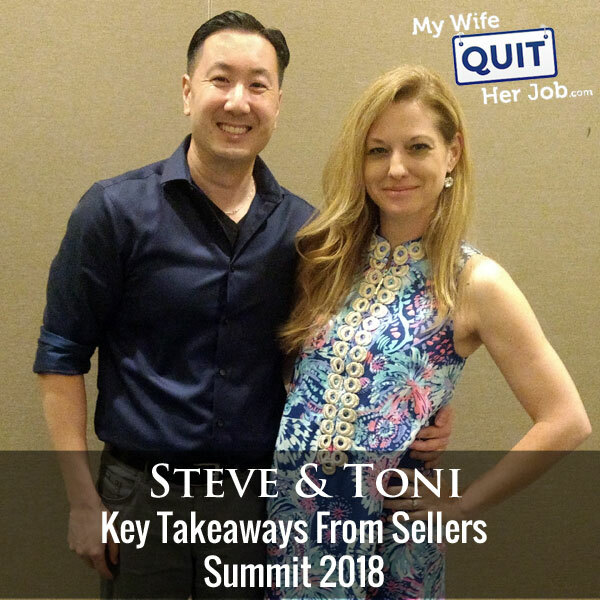 In this episode, I brought Toni Anderson back on the podcast to do a recap of Sellers Summit 2018. The Sellers Summit is a conference that Toni and I throw every year. This is our 3rd straight year and it’s all about bringing ecommerce entrepreneurs together and learning new strategies on how to sell physical products online. Today, we’re going to do a recap on what worked, what didn’t and some key takeaways from the sessions. Right virtual passes for Sellers Summit 2018 are available for sale until July 1, 2018. And as an added bonus, I also invited Scott Voelker from The Amazing Seller, Mike Jackness from EcomCrew and Greg Mercer of Jungle Scout to join me in a private Q&A webinar for virtual pass holders on June 28, 2018 at 10AM PST. You’re listening to the My Wife Quit Her Job Podcast, the place where I bring on successful bootstrapped business owners and delve deeply into what strategies are working and what strategies are not in business. Today I brought my partner Toni Anderson back on the show to help me give a recap of this past year’s Sellers Summit, which is a conference that I give every single year. We’re going to talk about what worked, what didn’t, and talk about some of the key highlights and takeaways of some of the ecommerce sessions. But before we begin, I want to give a quick shout out to Klaviyo who is a sponsor of the show. Always excited to talk about Klaviyo because they are the email marketing platform that I personally use for my ecommerce store, and I depend on them for over 30% of my revenues. Now, Klaviyo is the only email platform out there that is specifically built for ecommerce stores, and here is why it is so powerful. Klaviyo can track every single customer who has shopped in your store and exactly what they bought. So let’s say I want to send out an email to everyone who purchased a red handkerchief in the last week, easy. Let’s say I want to set up a special auto-responder sequence to my customers depending on what they purchased, piece of cake, and there is full revenue tracking on every single email. Now Klaviyo is the most powerful email platform that I’ve ever used and you could try them for free at mywifequitherjob.com/K-L-A-V-I-Y-O. Once again that’s, mywifequitherjob.com/K-L-A-V-I-Y-O. I also want to give a shout out to Privy who is also a sponsor of the show. Privy is the tool that I use to build my email list for both my blog and my online store. Now Privy is an email list growth platform and they manage all of my email capture forms, and I use Privy hand in hand with my email marketing provider. Right now for example, I’m using Privy to display a cool wheel of fortune pop-up. Basically a user gives their email for a chance to win valuable prices in our store and customers love the gamification aspect of this. And when I implemented this form email signups increased by 131%. Bottom line, Privy allows me to turn visitors into email subscribers, which I then feed to my email provider to close the sale. So head on over to Privy.com/Steve and try it for free. And if you decide you need some of the more advanced features, use coupon code MWQHJ for 15% off. Once again, that’s P-R-I-V-Y.com/Steve. Now onto the show. Steve: Welcome to the My Wife Quit her Job Podcast. Today we’re doing a special episode because I’m not interviewing anyone on the show. Instead I brought Toni Anderson back on the podcast. And what we’re going to do today is we’re going to do a recap of Sellers Summit 2018. And if you don’t know Toni, she is my partner in crime for the event. And this is actually appearance number five or six I think for her on the show. So if you guys have been listening for any period of time you’re probably already familiar with who she is. Anyway, the Sellers Summit is a conference that we throw every single year. This is our third straight year and it’s all about bringing ecommerce entrepreneurs together and learning new strategies on how to sell physical products online. And today we’re going to talk about what worked, what didn’t, and some key takeaways from the event. So how are you doing today, Toni? Thanks for taking the time to come back on. Toni: Awesome. Thanks for having me. It’s always a fun thing to do. Steve: So it’s year three. Last year I remember telling you that I was worried about hitting a sophomore slump, but this year actually turned out great. And just when I didn’t think it could get any better, I actually felt that this past year was the best one yet. How did you feel going to this year? Toni: I thought it was great too. And I think the main reason for that is the people. Steve: How so, how were the people different this year in your opinion? Toni: Well I don’t think they were different. I think they were the same, which is what made it better because last year, the very first year we knew what we were doing, but we didn’t have the relationships with the people. The second year, we had some people return from the first year. So it felt like we were seeing friends as opposed to just new attendees that we hadn’t met. And this year we had a lot more returning last year — attendees from the 2017 event. So it really felt like when we saw people, we were excited because we knew them. We had been chatting with them off and on throughout the year, and we got to hear updates on their business. And so it was more — this year felt like we were just hanging out with all of our friends, don’t you think? Steve: Yeah, no, totally. There was a much higher repeat rate this past year than the first year that we did it. And I felt like I was just seeing a whole bunch of old friends this time around. Toni: Well, and it’s crazy, because we’ve already opened up ticket sales for 2019. And we’ve had almost half of our tickets sold already to previous attendees, which to me is so cool. Steve: I mean, I think that’s indicative of the fact that I thought this was the best year that we’ve had, right? The fact that 50% of the people are willing to put their money down for something that’s not even happening for another year really says something about this year. Toni: It must mean that we’re fun to hang out with, that’s what I think. Toni: Actually, I think we want to hang out with each other, which is fine with me too. Steve: Yeah, that’s okay. I mean, you know how it is. We took the same — what’s cool is we didn’t really change up the formula, I didn’t feel like we did. Toni: No, not really it’s pretty much the same. Steve: And well okay, so one thing I personally liked was that we expanded the mastermind and we ended up getting a bunch of, I guess more seasoned sellers. And so that way, at least for me, I felt like everyone knew what they were doing this year. And I think that added a lot to the event as well. Toni: I agree. And I think that getting — I think the mastermind helps us several ways. But I think one of the really cool things about it is that this year we had about 60 people and several masterminds. And so, all those people had an extra day together. And so by the time the actual event kicked off, even if they didn’t know each other on Wednesday, by Thursday night, they were all best friends because they had been together for 24 hours and really had been having really great conversations about their businesses. So they seemed to already have the friendship developed. And what was also cool, is even people that either didn’t qualify for the mastermind or were attending for the mastermind, a lot of people came in early just to hang out. Steve: You know what I thought was really cool is that compared to the prior year, we’ve all kind of evolved as a group. So people who were in the mastermind last year at the 250K level, well, a lot of them actually qualified for the $1 million mastermind a year later. And so it was pretty cool to just kind of watch how everyone’s businesses has grown and evolved in just one year. Toni: And that’s one of the favorite – my favorite things about the event is hearing about people who, a great example is Dean who came to our very first Sellers Summit and he didn’t have a product. If I remember correctly he had an idea, but he hadn’t launched or anything. And this year he was in the 250 and I think he messaged me the other day and said that he’s qualifying for the million dollar mastermind next year. So it’s exciting to see people who we basically knew before they even started their business and now we’re watching them and hearing their success and also hearing their strategies which I think is amazing. Steve: Yeah it’s crazy, right? In just two years Dean took a business from nothing to a million dollars in revenue which I found is crazy. Toni: I need to be Dean’s best friend now. Steve: Yeah I got to figure out what he’s doing. Steve: I mean that’s pretty fast growth in my opinion. Toni: Yeah, on a pretty simple — I mean, he’s got a simple product. He’s not out there selling 500 things. You know, he’s got a real basic business model, which I think makes it even a better story. Steve: Basically, he’s got one product with a bunch of variations, right? Steve: I mean, I don’t know about you but once again, I felt like I was kind of running on fumes during the event. I ended up speaking three times, and I’ve never felt like I could really relax. But I did have a blast. How did you feel about just kind of the event overall, from your perspective? Toni: Well, it’s always interesting when you’re behind the scenes, because you see a lot of the things that go wrong that you hope the attendees don’t notice. But overall, I thought it was great. I had a great time and for me, it truly it is about seeing everybody and their relationships. And I actually get a ton out of the sessions. I think it’s why I love that we do the recordings because the ones that I don’t get to sit in, I’m able to hear later. But I found myself in a couple of sessions hoping that my phone didn’t go off with someone needing me so that I could actually sit in there and take the notes and learn while I was at the event. Steve: Well, what do you think went wrong this year actually? I was trying to rack my brain for that. Toni: You know we didn’t have any major — we had a few little glitches here and there, but for the most part, everything ran pretty smoothly during the event. Steve: I mean, I know we were on time for everything. And then everyone showed up, which is good. Steve: Is that unusual. Actually, I don’t run a whole lot of events so I don’t even know. Toni: I think it’s unusual. I think there’s a lot of people that buy tickets and then just — it’s not worth going, maybe they have something else come up. But we had an attendee this year that her son’s prom was one of the nights of the event and she agonized over what she was going to do. And she decided to come just for Saturday. And she said to us, I still remember her Pam, Pamela, she said at the end of the event, it was worth coming just for the day. So I think that’s one thing that people really want to be there. They really want to learn. They really want to have those connections with people and I think this year just like every other year and the other one of my other favorite things is our speakers are so awesome and so accessible that I mean, I know that you get these emails because I get them too of attendees that email us afterwards and say, thank you so much for having this speaker. They took the time to speak with me after their session. They open their computer with my website; they go above and beyond what I think a lot of the typical speakers do at other events. Steve: Oh, no, totally. I mean, that’s actually one of the things that we tell speakers, if you’re going to speak for the event, we’d like to stick around, just hang out with everybody. Toni: Yeah. So I love that. And I love getting those emails at the end hearing those stories because to me, and it’s funny because, like, we get these emails from the speaker saying, hey, I learned so much at the event too. So I think our attendees are teaching our speakers, our speakers are teaching our attendees, our sponsors and our attendees, everyone’s connecting on a level that I think is really profitable for everybody’s business. Steve: Yeah, and we’ve had a nice core of repeat speakers as well. And I feel like all the speakers have become friends with the attendees as well. So for them it’s like seeing old friends as well. So that’s another incentive for them to come speak as well. Toni: Well some of our speakers and attendees have worked together on other projects. It’s just cool to see how everyone is growing and evolving over the years. Steve: Yeah. And every year we send out a survey. And this year, the feedback was once again overwhelmingly positive in regards to the networking aspects of the conference. And we did it really straight from the standard formula, we kept everything small, catering lunch, had cocktail parties every single night. But I can’t really put my finger on it. I thought the networking was better this year. And perhaps that just has to do with the fact that more of the sellers this year were experienced. Any thoughts on that? Toni: I think it has to do with that. I think it has to do with the fact that people already knew each other for the most part, and that if you were new, it was easy to kind of get in with a group because we also have the Facebook group that people who have attended the event are part of. So you kind of have the opportunity to network and meet people before you even show up. And I think that’s actually really important because I think we both have been in that situation where you go to an event and you literally know nobody, and you’re standing there at the first networking party in the corner hoping no one talks to you so you can be there for the set amount of time and then go back to your room, right? And I think having the Facebook group and allowing people to virtually meet each other before the event, that way when you’re sitting there people are walking up to you, they know your name, they recognize you from a Facebook post or even a question that people are posting in the Facebook group. So I think that’s one of the reasons why the networking events get better every year is that we really push the pre networking in the group, and that way there’s no strangers. Steve: Obviously so here’s one thing I thought we did really well. We encouraged a lot of people to do Facebook Lives in the private group, and by seeing a video of someone kind of give their introduction and their background that made people a lot more memorable when you actually met them in person. And I got to give a quick shout out to my boy Troy Gilboe. So Troy if you’re listening to this — so what ended up happening is Troy posted I guess an old goofy picture of himself, and then I turned it into a meme and then we all got into it and before you know it we were just going back and forth with these Photoshop battles. Toni: I don’t think anyone should actually Photoshop battle you, but Troy is a great sport and he actually had some awesome Photoshop work himself. Toni: Yeah I think he’s one of our most interesting attendee; this is his new nickname, right? Steve: Most interesting man in the world yes. Toni: Yes but I think that helps a lot because no one wants to be the outsider looking in, everyone wants to feel like they’re part of the community. And I think the Facebook group goes a long way in helping people with that, so when they get there they’re not — and I think having the networking events too every night is helpful. And then just keeping the event small and keeping everybody sort of in close proximity to each other, you’re always bumping into people in the hallway. Even I noticed like for dinner people are going out to dinner, we have dinner groups, people are meeting up. I know everywhere I looked I saw attendees with each other, and a lot of them were like new attendees, with returning attendees, and everyone’s sort of meeting each other. So I think that all works together to provide an atmosphere where people are encouraged to build those friendships. Steve: Speaking, which I do want to thank Susie. What she did, and this is not — this is kind of an outside event and Susie didn’t have to do any of this stuff. But she organized a lot of dinners and meals for the attendees so that no one felt left out. Like if you were brand new, you could go on this page, sign up for a dinner group and not feel left out at all. Toni: Yeah, thank you. Susie was a rock star for us actually this year and last year, she’s coming back in 2019. So hopefully she’ll be helping us out again, she does this completely volunteer, she’s a complete volunteer for us and just took this on herself and really did an amazing job. Steve: Absolutely. So Toni, before we get into the key takeaways, let’s start by talking about kind of what we did differently maybe this year that added to — we kind of covered some stuff already, but what were some of the differences between this year and last year? Steve: We stopped padding ourselves on the — pad yourself on the bed too hard. Toni: Well it is complicated, but I realized it’s actually something really valuable. And if that many — we got a ton of feedback on it. And so if that many attendees wanted something that I thought it was important that we figured out how to make it work, even if it was a little complicated, and it still wasn’t perfect the way it ran this year, and I think we can make it better I think, but I don’t know. If you don’t know what our roundtable sessions are, we basically take about an hour and a half and all of our speakers host a table of about nine people where you can sit there and talk in depth whether it be about their session topics and maybe you went to their session and you had more questions, but they were a little more specific to your own business so you didn’t want to talk in front of the whole group, or maybe just didn’t understand something you wanted more clarification or you just wanted to continue to learn and learn from everybody else’s table. And so we do that. And this year, we had two sessions. So you got to pick two different speakers or two different topic groups will be a better way to put it, and basically go in a deeper dive into that part of the business and that part of ecommerce. And I think that I’m glad that we did it that way. We gave people two options this year, because I think it was hard just to pick one honestly the first year, and people really want to learn while they’re there, so any opportunity we can to increase those learning opportunities we should take it. Steve: I mean, I know for me, like when I’m watching a session, I’ll never ask a question. It’s just not my nature. Like when I was in college, I just sat at the back and I just kind of dozed off. It’s the same thing at the sessions. I’d rather just talk to the speaker one on one afterwards and the fact that we have these roundtables makes it just a whole lot easier to just raise your hand and the get courage to just ask a question in a small group environment. Toni: Yeah, and not everybody who does want to, you know, especially most events, you have to take the microphone; you have to ask the question on the microphone. Not everybody wants to do that, and I totally get it. So I think that the roundtables provide an opportunity for people, or that they just don’t want to publicly share in front of 100 people, but they’re okay with sharing in front of five or six. Steve: So one thing we also did was we kind of did away with the VIP ticket and then replaced it with two mastermind tiers. And the reason we did this is we found that people who are making 250K and people who are making over a million, they basically had different problems to talk about. And so I moderated one of the $1 million masterminds and we talked a lot about personnel and some of these scaling factors involved in growing a business, which were a lot different than some of the conversation that had the priority when I moderated the 250 plus mastermind. Toni: I agree and I was in a 250 group this year, and a lot of the issues that we were facing in that group were next steps for business. How do we scale? How do we get to 500, 700k, a million? And what sort of things do I need to reduce in my business to make the other things more profitable? So I think you’re right. The conversations are very different. And I think I’m glad that we separated in this year. And we do bring everybody together for lunch and for networking. So it’s not like we’re completely segregating everybody. But I think when it comes down to specific business problems, it was better to have that separated groups. Steve: And for all of you guys who aren’t familiar with what a mastermind is, basically a mastermind is where we kind of pre-vet sellers based on revenue. And then we kind of lock ourselves in a room, we cater in food, and we basically spend the entire day helping each other with each other’s businesses. Everyone takes a turn in the hot seat where they get to ask a question and everyone in the group basically helps them with that one problem. And we also all share a strategy that’s working with our ecommerce businesses and everyone has their own tactics. They all have their own strategies and it’s very rare that someone is not able to contribute something. Toni: And I feel like I learned so much just moderating those and sitting in them. I feel like I leave that at the end of that day, just with so many ideas for new things to do in my business. It’s hard to, it’s almost too hard because you want to like do all these new things but you realize you need to stay focused. Steve: Yeah, and what’s cool about it is we kind of go into this room with a pact that everything that’s talked about in this room, stays in that room. And what I always enjoy is how open and comfortable everyone is, and how willing everyone is willing to reveal their problems and triumphs. And we purposely, obviously, don’t put people in a group together that could be potential competitors. Toni: Right, we actually spend a lot of time putting people in the groups for that very reason. And we have people fill out a survey and then we try to match people too with personalities. And so feeling like these people would be maybe not the best people in the same group versus other people that we think would mesh well together. And since we have a lot of returning attendees, it makes it easier to do that as well. Steve: Absolutely. And I always end up learning a lot myself. And by the end I feel especially close to the mastermind attendees because when you spend eight hours in a room together, you get to really know each other in depth. Toni: And the other thing, I think that I liked that we did this year, and I think we’re continuing to move towards this is we basically had — we’ve in the past had two tracks with more beginner and advanced and this year we did basically Amazon and off Amazon was our two tracks. And so, I really appreciated that because I’ve been focused personally on growing my off Amazon business over the past 12 months and so those sessions were really valuable to me, because that’s, I mean, I’m not — I love Amazon. I appreciate everything they’ve done, but I really focused on the other part of my business. And so to have those sessions to me was really valuable this year. Steve: That’s actually a great segue into what the conference theme was about this year. So I got up on stage for the keynote, and I started off the conference by talking about Chinese people. The Chinese sellers are dominating Amazon right now. And they’ve really raised the bar in terms of what it takes to be successful in ecommerce. And so all the talks this past year were specially curated to help you succeed in 2018, build your own brand, and really stand out of the crowd. I think the statistic that surprised me the most was that 25% of the sellers on Amazon are now based in China. And they have a lot of inherent advantages. And so that’s why establishing your own brand is even more important than ever. Toni: Yeah, and I definitely I mean because we talk a lot about business off the podcast, but I’ve dealt with Chinese sellers since basically day one. And it’s made me realize how important it is to be building these other channels. And so I loved the fact – actually one of my favorite talks was Bernie’s on selling on Wal-Mart because I’ve been contacted by Wal-Mart frequently in the past six months. And after going to Bernie’s talk, I realized I don’t want to be selling on Wal-Mart right now, but honestly like I appreciated him getting up there and basically creating a case study on why it’s not worth it, most likely not worth it for your business at this right now. He laid out like hey, but if your business meet this criteria and this criteria, then maybe you should be, but if you’re in this bucket it’s probably not a good idea and you need to focus more on these things. But I appreciated that he was really blunt with it because I don’t want everyone to get up there and sugarcoat stuff and make me think that everything is for me when clearly Wal-Mart is built for certain sellers right now and not for others. And if you don’t fall into that group, your time is better spent elsewhere at this stage in the game for Wal-Mart. Steve: Yeah, no, absolutely. I mean, these days, I would say that if you are just selling a handful of products on Amazon, and let’s say you’re doing well, it’s still not going to be a long term sustainable business, or you’re putting your business at risk, I should say, because a number of things can happen like a group of Chinese sellers can attack you or something might go wrong with Amazon, they might ban you. And so it really pays to kind of spread out and diversify your marketplaces so to speak. Toni: Yeah, and I appreciate like, that’s one of the things I appreciate about our speakers is they’re just really honest about these things. And so you don’t go in there — you don’t come out of a session thinking that you can do everything, you come out, I think more focused. Steve: Yeah, and we did talk a lot of time about — we spent a lot of time talking about branding. And when it comes to brand, it’s more than just getting a logo and designing really great packaging, right? That’s just like par for the course. I think the only way to establish a true brand is to establish a connection with the customer, have the ability to bring them back over and over and over again until they are ready to buy and establish some sort of mindshare with the customer. And so a lot of the sessions this year were specifically curated along those lines. So, for example, Mike Jackness, he gave an incredible presentation about Facebook Messenger strategy. And right now, a whole lot of people are not using Facebook messenger to market online. I recently just started doing it, I would say in the past four months, and I’ve been averaging 90% open rates and 30% click through rates, which is unheard of. Like if I look at my email, I’ll get like 20% open rates and maybe like 2% click through rates. And so I really enjoyed Mike’s talk. Toni: Yeah, I missed, he’s one of the ones I need to — I get to listen to on the recording because I was not in there. But I’ve heard the same thing from everybody that was at that talk. Everyone is very pro messenger I guess that’s the best way to put it. Steve: Yeah all the talk. So we never went to the same talk, right? Because I had to sit to moderate, so maybe we should just ping pong back and forth. So I just talked about Jackness, you want to talk about a talk that you went to? Toni: So one of the talks that I thought was — and I love, Daniel Solid is one of our speakers. I think he’s attended every year, I think he’s spoken twice. Every time I go to his session, there’s always like one thing that he says as sort of like a mind blown moment for me. So this year he gave a talk about patenting and actually preparing your business to sell and an exit strategy. And I thought some of his ideas for getting patents and ways that you can create new products and create better products that you’re able to get a patent on were really, really interesting and stuff that I think most of us probably aren’t thinking about on a daily basis. And I feel like his brain is just always thinking about that kind of stuff. So his he and I, it was funny because every time I have that moment, I look around the room, and everyone is frantically, they’re taking a picture of the screen, or scribbling down notes. So I always appreciate Daniel because he’s got these very different type strategies sometimes that I think aren’t as much mainstream as what we hear on other podcasts and reading different publications and stuff like that. Steve: You know, what I like about Daniel’s style is that he’s a very long term thinker, like literally thinks like years in advance. And so, all the moves that he takes are for establishing a long term business as opposed to just making a quick buck in the next year or so. Steve: So one of the talks that I went to, which I know you wanted to go to, but I insisted on going myself was Dana’s talk. Toni: Yeah you beat me. Steve: What I like about Dana is she’s one of the sellers that I can really relate to because she just very down to earth. And what she did is she taught us her exact protocol for kind of gathering data and monitoring key metrics about her business. And one thing that her talk did, she made me really think about my priorities, like, what are my key objectives and what is the main reason why I even run my business? And so what Dana does is within 15 minutes every single day, what she does is she gathers key metrics about her business. And those key metrics basically just tell her what the health of her business is and where she needs to improve. And it just takes a couple of minutes every single day and she gets like a high level overview for business. And that’s how she knows that her business is on track and meets her priorities and goals. I don’t know if I explained that very well. You just have to watch the actual talk to understand. But a lot of people they go into business not knowing what their objectives are and they don’t know what’s making a profit. They’re just spending money like crazy. Money is coming in but they don’t really have a firm grasp of all the metrics for their business. Toni: Well and I think what I appreciate about Dana is that she doesn’t have this huge team, her businesses are very simple and her strategies are very simple and she bases everything on this sort of logic in numbers. So it takes a lot of the — I feel like this is a better idea out of it. And it really gets you to make decisions based on hard like numbers and facts, which I love. Steve: Exactly. I mean, she has a gut feel for stuff but she always makes her decisions based on the numbers. Steve: And her happiness actually, the happiness factor factors in. Toni: Yeah, Dana is always one of my favorite speakers and I look forward to her. I look forward to just talking to her every year. I feel like I learn something every time I’m just standing by her. My turn okay. So another talk that I didn’t think that I would love but was actually very interesting was Nathan’s talk on your supply chain because we’ve been doing this for a couple years now. I feel like we have a pretty good system in order with dealing with our suppliers. But I think his talk compared with my trip to China and sort of finding new suppliers and seeing some maybe kinks in our system. He basically walked step by step of things to look for in the whole process of sourcing and getting your products here where you think, I always felt like hey, we’re doing pretty good, our margins are decent. After listening to his talk, I realized, hey, there are some things that I can actually go back and maybe make some adjustments and even increase our profitability or just make changes in our business overall, to just help our productivity and things like that. Steve: Yeah, along those lines, Greg Mercer gave a great talk about how he sells oversized items on Amazon. And when you sell oversized items on Amazon, it is very important to eke out every last dollar out of your supply chain. So Greg Mercer’s talk actually applied really closely with Nathan’s talk. And what’s cool about Greg’s talk is he gave a very detailed overview on how he ships flat pack containers directly to Amazon from the manufacturer without even seeing the merchandise. So he cuts out a whole bunch of intermediate steps and he ends up saving thousands of dollars in the process on shipping. It was eye opening. Toni: Well, and I think too, that’s actually a question that’s come up in the profitable online store Facebook group over the past couple of weeks. I think I’ve seen that in there with people asking about that specific thing, or would you ship directly to Amazon? What are the risks? How is that going to work for your business? So that’s a talk I’m looking forward to listening to because I wasn’t in that one. Steve: I think one person who attended Greg’s talk said that that one talk saved her thousands of dollars every year already. So that already made her conference worthwhile. Toni: Wow. Well, on the opposite of saving money, I’m ready to spend money on Google Shopping after listening to Brett Curry’s talk. He gave a very step by step talk on how to set up Google Shopping, why you should be using Google Shopping campaigns, and basically how to get started doing that. And I think I met Brett with you a couple of years ago in San Diego. But I was excited for this talk because I feel like for a lot of brands, including what I’m doing, there’s not a lot of competition. And so way less competition to actually do like a Facebook campaign. So I’m excited to get those started and actually just started working on that in the past couple — since I got back from Sellers Summit to set up some campaigns because he does a really good job of just walking you through just basic steps on how to get set up and how to get started. I think people — it’s a sort of a missed opportunity for people. Steve: So I’ve been running Google Shopping campaigns for a very long time. And in fact, at the first Sellers Summit, I gave a session on Google Shopping as well. In these past couple years, Google has added a whole bunch of new features to Google Shopping to make it even easier to target people online. And so what we did this past year is I actually had Brett run my shopping campaigns, and he managed to increase the revenue out of my shopping campaigns with some of these new features. And it was — I don’t know, I didn’t get to attend Brett’s talk and I don’t know if he even referenced the case study at all. But the stuff that he talked about does in fact work. Did he talk about the case study at all or no? Toni: Not a ton. He did reference it but yeah he really just kind of walked us through how you get started, basically the why of why you should be doing it and then how to set it up. And it’s pretty easy if you’re on a platform, it integrates pretty simply. Steve: Right yeah. And I’ll probably be writing a blog post that details this case study as well, and so I’ll probably link that up once it’s available as well. So I attended my talk. Steve: It was very well received. And one of the main emphasis of my talk was that a lot of people they grow their revenues for their ecommerce store just by releasing more products. And that’s probably the easiest way to do things, but it’s also the most complicated and involves the most amount of work. A much better use of your time is to target repeat customers on both Amazon and on your own online store. And I gave a whole bunch of real life examples of how we’re doing that with our own store. And right now, only 12% of our customers, since we’re in the wedding industry are repeat customers, but they actually make up 36% of our revenues. And so whenever a brand new year starts, just based on our existing customers, we already have a nice solid base of 36% right from the bat, which provides a really good foundation to grow your business going forward. As opposed to if you’re just constantly getting new business, the cost of new customer acquisition is always really high and there’s no guarantee that you’ll get those people back. So you’re kind of starting from scratch each time if you’re only going after new customers. Toni: And it’s interesting because that was actually in the mastermind group that I was in. One of our primary conversations throughout the day was getting those repeat customers and focusing on those people that are your repeat business. That seemed to be a theme through many of the people that many of the attendees in the mastermind group, so I’m sure they were there in your talk or will be watching it. But it was definitely something that we talked about a lot, even in the mastermind session. Steve: Oh, yeah, totally. I mean, it’s definitely the way to go. And that’s one of the key advantages of having your own brand, as opposed to just depending on Amazon. Steve: He’s like the LeBron. Toni: Yes, he is the LeBron of product selection. So I actually want to watch it again because he gave us so much information in his 55 minutes or whatever the time he had just about how do you find products? How do you optimize? It was just it literally was a fire hose. So that’s one I need to watch. I actually had to step out in the middle too which didn’t help because he was just going and going and going. But his knowledge is like he didn’t need the slides, he didn’t reference anything, he just was, it was just off the top of his head and people were hitting him. The question and answer in that time was also really good. It’s worth — I know so many people skip the Q&A at the end, because sometimes it doesn’t apply to you. But definitely watch the Q&A and that one because the questions that were asked were actually really good questions and they were applicable to anybody selling. Steve: Yeah, and while that was going on, I think I was at Xiaohui’s — we just call him X.
Steve: He covered email marketing. And man, I know a lot about email marketing, and I learned a lot of it from X. But X managed to cover like all of email marketing in 50 minutes. I remember when he sent me the slides I was like, dude, there’s no way in hell you’re going to be able to get through all of this stuff because it was really dense, full of information, but he ended up covering all of it. It was an amazing talk, but it’s one of those talks that you’re going to have to watch multiple times to get everything taken in, because he basically covered almost every single email marketing strategy in this one session alone. Toni: Yeah, and I got to eat dinner with him one night and I was just blown away by him, just such a smart guy. And that’s one of the talks that I missed. So I’m excited to watch that one now. Steve: Totally. And we didn’t even have time for Q&A, so I bet his round table was packed. Toni: Oh yeah, it was absolutely packed. I walked by it a couple times. Speaking of people with big personalities, I don’t know who got to see Zach Smith give his talk on Kickstarter campaigns. But he’s got — he’s another one of those people that you just can’t help but smile when you’re around him. Just the nicest guy and lives, eats, and breathes Kickstarter campaigns. In his, he walked people through how to launch a Kickstarter and obviously he has a company that does that, but he basically taught people how they could do it on their own and some of the really — he went through I think they were the seven Ps of qualities that you had to have to have a successful Kickstarter. And basically if you’re missing one of those the chances of you being able to– and I’m not super familiar with Kickstarter campaigns, but I know vitality and those are pretty important to get to a certain point and then sort of takes on a life of its own. So he went through that with the attendees and basically taught them how to find the right product to do that with because not every product fits. And then once you think you have the right product, the things that your product, the characteristics and the character [ph] of the campaign so that you can be successful. Steve: Yeah I think Kickstarter is grossly underutilized. You know how — one of the main problems of ecommerce is that cash flow can be a problem; you have to put your money down in order to fund your inventory. And if you do a Kickstarter correctly, there’s a lot less risk involved because you’re actually making — you’re raising money to fund your first production run and that greatly reduces your risk. Toni: Sorry. It was interesting to see he had some case studies that he shared of clients that they had worked with. And it was interesting to see things that they had done that it even turned campaigns around after an initial slower launch. Steve: I think while Zach was talking, I was in Reza’s talk. And he talked about dynamic ads retargeting or sequential dynamic ads retargeting. And what I discovered from his talk is that I’ve been running my retargeting ads wrong this entire time. And Reza very clearly, you can tell Reza is an engineer because he outlined a really enlightening retargeting strategy that relies on telling stories about your brand as opposed to just going for the straight sale. And whenever you tell — when you arrange the ads in the way that he was talking about with sequential dynamic ads retargeting, you’re much more likely to get the mind share of the customer, which will lead to repeat sales and longer term customer value. It was an amazing talk. Toni: Oh, I got to meet him briefly. And I can — just from his personality; you can tell that he is very detailed in that way. Steve: Yeah, I mean, he’s very analytical. And he basically spelled out everything step by step. And as soon as I got home, I ended up implementing his retargeting. He runs the company that does this for you, but he also taught us how to do it step by step by hand as well. And that was the route that I chose to take. Steve: I was just going to say especially because his software doesn’t support my shopping cart. Get to work on that Reza if you’re listening to this. Toni: That’s right. A long time speaker alumni is Scott Volker. And if you know Scott, you know he is a great speaker. Toni: Yeah, he’s so boring. Yeah soft spoken. But Scott did a talk on how to launch a six figure brand in 2018 which I think everybody knows in the Amazon landscape for sure it’s just getting harder and harder. And he walked everybody through his whole process from not really brand — not really product selection but basically once you have a product, the steps that he’s taking to move forward and launching without any built in audience really. And as always, Scott does a great job in just breaking down all the little details that you need to know. And working with, even if you don’t have any Facebook fans, or you don’t have any email list, or you don’t have anything you can still do – it’s still possible to do. And I think a lot of people think, oh, it’s too late to get on this, launching new brands and things like that. But he really gave a, oh my god, what’s the word, roadmap, gave a roadmap for being able to do that, even in this landscape, which is so competitive these days. Steve: I didn’t get a chance to attend his talk, but I was in the adjacent room and there’s this pretty thick wall between our sessions and I could hear his talk from the adjacent room. Steve: Which was soundproofed, yeah. Toni: He’s not quiet but anyway, if you know Scott, he’s just great to have at the event in general because he’s one of those speakers that just talks to you all night long and help you with your business. And so we love that. And Chris Shaffer actually came; his partner came too and helped out with the roundtable. So it’s always great to have Scott and it’s always interesting to see what he’s working on, and he’s always willing to share that with everybody. Steve: Absolutely. And while Scott was talking, I was in Edwards talk. And he did an amazing job on teaching people how to run Amazon sponsored product ads. And what I did this year is I purposely asked him to do a much more advanced talk since all the basic stuff is already covered, you can find out stuff online. And one attendee Pamela, who we talked about earlier, who attended his talk said that her ACOS went from 60 to 70% down to 15% within a week after implementing Edward’s strategies, which I thought was pretty amazing. Toni: That’s incredible. And I know Edward poor guy, I think he met with any attendees that wanted to meet with him over the weekend. Every time I saw him, he had a computer out and was sitting with somebody working on their sponsored product ads. So just his willingness to meet with people one on one and walk them through it was phenomenal. Steve: I mean, he enjoyed every minute of it he said. He’s kind of like a sponsored product ads geek. He pulls all nighters for this stuff, too. He’s just really into it. Yeah, I couldn’t understand it. But yeah, he just loves it so much. Toni: Yeah, he was definitely busy. Another talk that I actually was very bummed I had to walk out of because I had to go take care of something was Brad Moss. He’s a former head of Seller Central. And he talked about accessing hidden analytics on Amazon to get repeat customers. And I’ve actually only heard the first 10 minutes of it, but that’s the one video that I actually have downloaded and ready to watch from Sellers Summit already, because even within the first couple of minutes of his talk, I was completely hooked and actually very irritated that I had to leave because I always learn so much from Brad anyway, just in our conversations, and I know that he’s got definitely special insight into these things. And so I’m very excited to hear what he has to say about this. Steve: Yeah, I was bummed to have missed his talk as well because he always delivers. I think his last year’s talk was one of the most popular ones. And this year, the whole topic of getting repeat customers, he really hammered that home in his talk on how to do that on Amazon. Toni: Which some people think is impossible. So I’m very excited to hear what he’s got to say. Toni: Well, we’re breaking all sorts of rules now. Steve: So while that was going on, Pam and I, we did a Q&A session this year about freight forwarding, and there’s all these inefficiencies in your supply chain. And the reason why we did a Q&A this year was to kind of cover some of the more advanced topics in freight forwarding, a lot of things in your supply chain that can be optimized. And I felt like we did a really good job of covering them all. Toni: Well, and what I love about Pam is even if you don’t work with her, she’s still willing to sit there and help you and she is — I mean, like all, I think all of our speakers are amazing. They’re just so nice and helpful. And they’ll go out of their way. They’ll stay up late. They’ll come in early. I know someone was meeting with somebody early in the morning to help them. It’s just they’re always available and accessible. And Pam is just, it’s like she embodies a lot of that. I feel like she’s just always available, always smiley, always helpful, and she doesn’t care if you work with her or not, she just wants to help people. Steve: I mean I think that’s a prerequisite to be a speaker. We get a whole bunch of speaker applications and we turn most of them down. And speakers that we do get; I’ve either met in person, had on the podcast, or they’re just people that we know personally. I tell them they’re going to stick around and they’re going to be really friendly. Toni: And it’s funny because we have some speakers that asked to come back and speak because they enjoy our attendees so much. Steve: Yeah, I mean, we do screen out the attendees to a certain extent too if you’re coming to the mastermind I guess. Steve: So are there any more sessions that we haven’t talked about? Toni: I think we’ve got, we’ve hit them all other than the — we closed out the event with a quick panel Q&A with Steve, Greg Mercer, Scott Volker, and Mike Jackness. And that was basically, we just passed around the microphone, let folks ask questions, and I think that was a fun way to end it just because it was very relaxed. Everyone was finished with the event as far as the pressure of speaking and doing a session with a PowerPoint. And so we just opened it up to the audience, let them ask questions. And that’s definitely one worth watching because we got people just kind of having a casual conversation. Steve: Yeah, absolutely. And once again, I think tickets, when we sold them, they sold out super quick. I think we were done in February. We were done earlier than that for the mastermind. Steve: And the main reason is we purposely limit ticket sales. It’s not a large conference. Toni: No, we can’t do that. That’s impossible. Steve: You can’t do that and maintain the level of networking that we have. Toni: I agree. I agree. Steve: So we actually opened up the tickets as you mentioned earlier in this talk to alumni only, and we’ve already sold 50% of our tickets for next year. Toni: Yeah, so if you want to meet some of our alumni, if you want to meet Troy that’s our selling point. Steve: So all these sessions that we talked about, we are still selling a virtual pass for this past year’s event. And one other bonus that we always do for virtual pass members is that we have a live Q&A. So I like to say that we’re bringing the conference over to you, in case you didn’t get a chance to attend. So all the video sessions are available for purchase, but we’re also going to hold a live Q&A webinar with a bunch of the speakers in the next three weeks or so. The exact date is TBD, but we’re going to do that to just answer any questions that you might have about the sessions. Toni: And if you’re not able to attend the live Q&A, it is recorded and available for you to watch at your own convenience. But we really do like you to be there live because then you do have the opportunity to ask questions. Steve: Absolutely. Yeah. So I’ll probably post the link to purchase virtual passes underneath in the show notes for this episode. And we already obviously decided where the conference is going to be next year. And where’s it going to be Toni? Toni: It’s going to be in Miami at the Conrad Hilton, right on the bay. So it’s a great location. It is very close to the airport and also close to tons of restaurants and places to sort of hang out when the conference is not going on. The hotel has a great lounge area and tons of space. So it will be another great event for networking and hitting all the dinners with everybody. And I think it’s going to be another great space for us. Steve: And what are the dates? Toni: The dates are May 15 through May 17. Steve: Yeah. I mean, one of the mistakes that we did this past year is we kind of overlapped this summit with the Canton Fair third phase, and that is not a mistake that we were making this next year. Toni: No, we pushed it back a little bit for everybody. And one other thing we listened to on the survey for you guys is a lot of you didn’t want it over the weekend. So this year will be the masterminds on Wednesday. But then the actual conference is on Thursday and Friday. So you will be able to fly home Saturday morning to make all the sports games proms, graduations and anything else you’ve got going on that weekend. Steve: Yep, that was one thing we changed based on the survey results as well. So underneath in the show notes, I’m going to be posting links to purchase the virtual pass as well as a pass for next year. And the fact that we’re already 50% sold out, I’m guessing that we’re going to sell out a lot quicker for this coming year. Toni: I agree. I think I love our alumni coming back. I’d love to see some new folks there. We did make the mastermind bigger, the actual sessions are not bigger, but we’ve opened up another block. So we did add some more mastermind spots, so if you are interested in that — but those always do sell out first. And those are definitely things that we can’t — at some point we can’t add any more. So we don’t have a lot of flexibility with that. So if the mastermind is something that you’re interested in, it’s definitely — and those are not recorded. There’s no way to access those for the main reason we want people to be able to share things honestly and not worry about anything getting out of that room. So that is definitely something if you’re interested in, I would not hesitate to purchase that pass. Steve: Yeah, absolutely. And we’re not changing anything up for the third year. We are purposely keeping the event small and intimate to foster networking. And I think we have a really good formula and we’re not really going to change much at this point. Toni: So you definitely want to join us next year. And if you’re not sure, grab a virtual pass from this year and just see what our content is about and see if it’s something that you think would help your business. Steve: It sounds good. Well Toni, thanks a lot for taking part in this Sellers Summit recap. Toni: Thanks for having me again and again and again. Steve: Well, you’re a fan favorite. No one listens to me. Toni: That’s another reason why they come to the summit too, right? Steve: Yes, it is. It is true. Steve: All right. Take care. Hope you enjoyed that episode. Virtual passes for the 2018 Sellers Summit are on sale right now until July 1st. And as part of purchasing a virtual pass, we’re also hosting a special private Q&A webinar with Mike Jackness of EcomCrew, Greg Mercer of Jungle Scout, and Scott Volker of the Amazing Seller. Now this webinar will take place on June 28 at 10:00 AM Pacific. So to buy your tickets go to sellerssummit.com. For more information about this episode, go to mywifequitherjob.com/episode210. And once again, I want to thank Privy.com for sponsoring this episode. Privy is the email capture provider that I personally use to turn visitors into email subscribers. They offer email capture, exit intent, and site targeting tools to make it super simple as well. And I like Privy because it’s so powerful and you can basically trigger custom pop-ups for any parameter that is closely tied to your e-commerce store. If you want to give it a try, it is free. So, head on over to Privy.com/Steve, once again, that’s P-R-I-V-Y.com/Steve. I also want to thank Klaviyo which is my email marketing platform of choice for e-commerce merchants. You can easily put together automated flows like an abandoned cart sequence, a post-purchase flow, a win-back campaign, basically all these sequences that will make you money on autopilot. So, head on over to mywifequitherjob.com/K-L-A-V-I-Y-O, once again, that’s mywifequitherjob.com/K-L-A-V-I-Y-O. Now I talk about how I use both of these tools on my blog, and if you’re interested in starting your own e-commerce store, head on over to mywifequitherjob.com and sign up for my free six-day mini course. Just type in your email and I’ll send you the course right away. Thanks for listening. Outro: Thanks for listening to the My Wife Quit Her Job Podcast where we’re giving the courage people need to start their own online business. For more information, visit Steve’s blog at www.Mywifequitherjob.com.